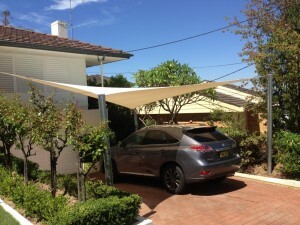 Shade Sails protect your valuable cars, boats and Caravan from the harsh Australian Sun. It also provides that aesthetic appearance to enhance the value of your property. Your vehicles need protection from extreme weather conditions, falling leaves and droppings from birds. Therefore a shade sail is the answer. When you vehicle is parked under the shade sail even during a hot day, you can get in and drive away without having to wait a long time for the vehicle to cool. We provide both shade sail and waterproof membrane structures. We highly recommend that you check with your local council about their guidelines.